"Affirmative training is the art of understanding the horse." Relaxed & Forward Training: We train with a profound concern for the horse’s mental and physical welfare. We listen to his Calming Signals and learn his perspective. We affirm the horse’s intelligence, empowering his confidence with positive energy. Join our Relaxed & Forward Tribe. We put horses first. Affirmative training is a way for a horse to find peace; a way he can know where he belongs in a chaotic world. Let him feel safe in your partnership. How is Anna Blake's Approach to Horsemanship Different? Relaxed & Forward Dressage: Lessons with me are firmly rooted in the principles of traditional Dressage; training relaxed and forward gaits with responsiveness and balance for the horse and rider. I combine this with a special focus on listening to Calming Signals, the natural language of the horse, for a partnership of understanding, confidence, and pleasure. I take horses and riding very seriously, but I do it with humor and lightness because horses like happy riders. Welcome. I’m a horse advocate first. I work as a trainer, international clinician, and award-winning author. I train horses and riders communication skills and dressage, and I write parables about horses and life. I offer Concept Clinics in the U.S. and internationally. Concept Clinics are an opportunity to explore a focused group of ideas with exercises designed to clarify and deepen the awareness and practice of a fundamental principle of communication or training. Clinics include Calming Signals, Dressage Rhymes with Massage, Rhythm and Dance, and others. The Print Version is my author blog where I share my passion for writing, offering workshops, and being a word geek, smiling like a fifth-grader in cat-eye glasses and a buttoned-up sweater because Grammarly is my new best friend. Stable Relation, a Memoir of One Woman’s Spirited Journey Home, by Way of the Barn, a Peoples’ Choice Gold Medal Winner. 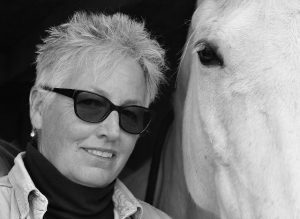 Join us in the Relaxed & Forward Barn, a warm place to ruminate with Anna and an interactive circle of like-minded horse people, focused on the art of communication, affirmative training, and all things equine. We advocate for the horse/human partnership, knowing a positive attitude is the best training aid.